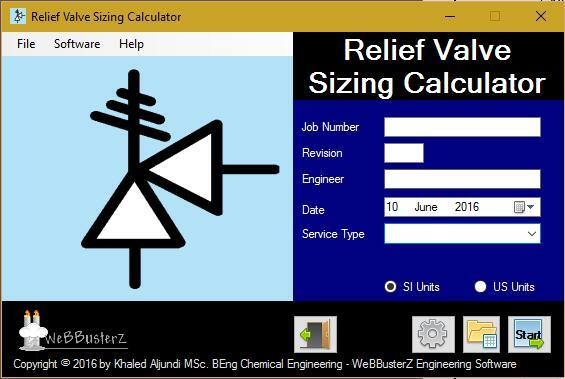 Pressure relief valve sizing calculator will carry out sizing calculations based on equations used in API 520 “7th Edition” and API 521 “4th Edition”. Make input in different measurement units for Volumetric flow rate, Mass Flow rate, Temperature, Viscosity and Pressure. Size conventional and pilot operated relief valves for gas or vapour relief. Size conventional and pilot operated relief valves for liquid relief. Size conventional and pilot operated relief valves for saturated and superheated steam relief. Evaluate multiple cases in one go. Save and load your input. Calculated variables are based on input and service, mainly the following variables are calculated for all services; Relieving Pressure, Required effective discharge area, Actual discharge area, Equivalent Orifice diameter of device, Installed Relief rate and Designation. More calculated variables are displayed depending on selected service and input parameters. For vessel fire case (Vaporizing liquids – wetted vessels) the software will also calculate the rate of vaporization, the total heat absorption and the total wetted area. Calculations support both vertical, horizontal and spherical vessel orientation. The demo version can operate for 30 days, the only limitation imposed is that users can save or load project cases as well as the ability to enter set pressure has been disabled. The demo version comes with preset examples and allow the user to change all inputs with exception to “set pressure” input.